Articles - Can AI Beat Doctors in Disease Identification? 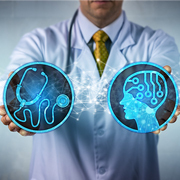 According to a recent study by Frost & Sullivan, the market for Artificial intelligence (AI) in the healthcare industry will cross $6.6 billion USD by the year 2021. It is also expected that AI will play an instrumental role in providing clinical support by reducing treatment costs by up to 50% and improving the desired outcome by 40%. As per research from Google Cloud, in a real clinical setup, machine learning (ML) could aid in identifying diseases more accurately, giving doctors the rationale for better diagnosis. An interesting aspect to note is that the medical tasks, like performing analysis of radiological images, could be completely automated. Thus, there is no doubt that leveraging AI in disease identification will transform the healthcare industry. However, it could be more challenging and complex, than what appears on the surface. Deep learning can assist in identifying anomalies in x-rays of the chest. And by leveraging the innate nature of deep learning being mathematically substantiated, companies are trying to use it to predict abnormalities. Sooner, it will be possible to completely understand and analyze a patient's health history and recommend the appropriate treatment. Further down the line, an interesting trend in the field of healthcare could be delivering AI solutions through the cloud. Dermatologists have claimed that artificial intelligence to identify skin cancer can be more effective than the normal diagnosing process. In fact, a deep learning based convolutional neural network managed to accurately diagnose 95% of skin cancers as compared to 86.6% by experienced dermatologists, after going through 100,000 images. This way artificial intelligence beats dermatologists, also allowing them to leverage AI in medicine to recognize and categorize skin cancer and start the necessary treatment, thus, restricting any further spread of disease. Advances in the field of AI have made way for more proactive, precise and customized medicine. The healthcare industry is bound to benefit from the developments that artificial intelligence brings to the table. Physicians will be able to make more accurate decisions by leveraging the pattern recognition and predictive analytics capabilities that AI has to offer. It becomes easier to work in areas like understanding the symptoms, diagnosing the ailments, analyzing test results, monitoring the outcomes of previous treatments, and prescribing the next course of medication. Doctors will be able to leverage machine learning algorithms to identify the symptoms of major diseases in real-time, with very minute chances of error. In the wake of rising radiology cost, AI has been a true redeemer for the doctors. They are now leveraging image analysis to identify disease patterns. Moreover, the AI-based solutions, which incorporates AI algorithms are assisting Radiologists to make real-time decisions. These AI models can analyze several images to identify trivial indications of a specific disease. According to a report by McKinsey, big data and machine learning can help save pharma companies up to $100 billion every year. Now, the computers can process zillions of patient data and unearth key patterns to accurately diagnose major diseases and notify the doctors to provide timely care, thus preventing any delay in the medical treatment. Physicians are banking on AI to get clues and direction to the next and upcoming development of pathologies. Machine Learning algorithms have made it possible to analyze the variations of a few pathological diseases, especially for neurodegenerative afflictions. Now, the early stages of dementia like mild cognitive impairment (MCI) can be easily detected, which will help the doctors to predict whether or not a particular patient will develop Alzheimer's disease. Professionals in the healthcare industry are collaborating with technology innovators to invest in systems powered by AI and machine learning and can compute massive volumes of data, to arrive at more accurate predictions and diagnoses. Machine learning algorithm is data-driven; hence it does not need to be explicitly programmed. If more data (variable) is fetched the results (predictions) would be more accurate. In the healthcare sector, there are tonnes of medical data, which, if processed, can provide helpful insights in providing the right treatment. However, due to the absence of any established process, and the possibility of a privacy breach, machine learning is not yet completely implemented. There are several companies like Sophia Genetics that are making use of AI to evaluate the DNA of their patients to diagnose diseases. Some companies are using mobile apps powered by machine learning to better understand the reasons behind the normal concussion, jaundice in newborns, blood pressure and other mandatory functions like lung function for those with respiratory concerns. It is important to improve machine-learning based medical equipment to accurately predict the odds of a patient being prone to heart attack. Companies are continuously working on this and are making sure that they enhance the ways in which heart attacks can be predicted and prevented. Pathologists are increasingly turning to artificial intelligence to accurately identify cancer cells amidst normal cells in a human body. The human and machine collaboration has resulted in 99.5% accuracy in diagnosing cancer at an early stage, by a Harvard-based team, as part of a contest at the International Symposium of Biomedical Imaging in Prague, in 2016. This team trained a computer in deep learning to scan thousands of images and identify cancer cells immediately. In another instance, a research team at Beth Israel Deaconess Medical Center (BIDMC) and Harvard Medical School (HMS) has created an AI-enabled system to make diagnoses of pathologic types more accurate. This group has trained the AI-enabled system to leverage multi-layer artificial neural networks to look at images and correctly interpret complex patterns in order to diagnose the presence of metastatic cancer in a patient's lymph nodes. Based on a convolutional network with several layers, the system can successfully differentiate between normal regions and cancerous tumor regions. Surgeons around the globe are seeking assistance from robots or AI-powered machines to execute precise and error-free surgeries. Medrobotics has developed a joystick-operated, flexible “snake robot” which can move to different parts of a human body, thus putting an end to any invasive procedures. Artificial intelligence in medicine, on its own, will not be able to replace doctors or the human element in the healthcare industry. Computers based on AI can process massive amounts of data, much more than a normal human being. This strength of machines will help human doctors work faster and more accurately. Collaboration is key here, not competition. Thus, partner up with an AI software developer who can take you through the nooks and crannies of developing your own AI software. Leveraging artificial intelligence to identify diseases is an ambitious endeavor, which is rapidly making its mark on all sorts of medical diagnosis and healthcare administration field. Just take into consideration that AI enabled software is like a child, which learns from the environment. Hence, give priority to the types, variability and the amount of data you feed to the system. Now, coming back to the question - Can AI beat doctors in disease identification? Yes. But you need a few things first - approval from the government to find the scope of the services you want from AI software, database (can be archived as well) to feed the system, and a data science service provider. Outsource2india has been offering a wide range of data science solutions and developing customized software for various industries for over 20 years. Together with the help of our experienced healthcare professionals & software developers, our data scientists are capable of leveraging the latest technologies like deep learning, machine learning, and artificial intelligence to tailor-make intuitive software for healthcare industry. We will be happy to work with you and create robust software that leverages full potential of data science. Get in touch with us to know how we can become your partner of choice in the field of healthcare with AI-enabled data science services.